Absorption refrigerators are autonomous thermal machines that harness the spontaneous flow of heat from a hot bath into the environment in order to perform cooling. Here we discuss quantum realizations of absorption refrigerators in two different settings: namely, cavity and circuit quantum electrodynamics. We first provide a unified description of these machines in terms of the concept of virtual temperature. Next, we describe the two different physical setups in detail and compare their properties and performance. We conclude with an outlook on future work and open questions in this field of research. Author, Patrick P. Potts, is formerly known as Patrick P. Hofer. MTM acknowledges funding from the ERC Synergy grant BioQ and the EU project QUCHIP. PPP acknowledges support from the Swiss National Science foundation, the NCCR Quantum Science and Technology (QSIT), the Swedish Research Council, and from the European Union’s Horizon 2020 research and innovation programme under the Marie Skłodowska-Curie Grant Agreement No. 796700. 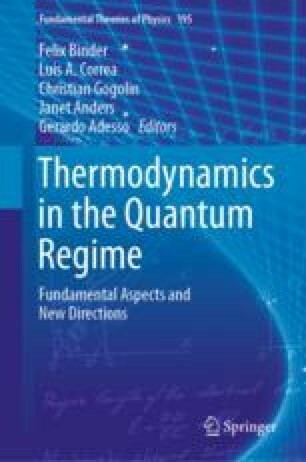 We also acknowledge the COST MP1209 network “Thermodynamics in the quantum regime” which fostered the research described in this chapter.